Some people use the phrase “old as dirt” but have you ever thought of using the term with the word salt instead of dirt? Well, if you have, you would not be wrong. In fact, salt has been around since there have been rocks and other minerals which are used to create salt. If you want a more direct time frame, salt dates back to about 6050 B.C. The proof comes from the many civilizations that were around since this period. Salt became an essential part of the Egyptian civilization and the Phoenicians as part of their trade. On top of this, many words came from the word “salt.” These words are generally used in our daily lives but probably not words you would imagine. For example, both the words salary and salad came from the word salt. Salary because of the trading that went on during the ancient civilizations and salad because the Romans would salt their leafy greens. Without a doubt, the story of salt is one of the least talked about yet common histories among cultures known to man. Ancient Egyptian Pyramids, History on the net. A few steps can explain the history of salt. First, the animals wore paths to salt licks. From there, the men followed the trails, which eventually became roads. And then the settlements grew next to the roads and the salt. However, there are other little bits and pieces within this history, such as the change in diets of humans. In the earliest civilizations, humans would put salt on their food but not much. But, over time, this started to change. As the food began to change, the amount of salt on food would change. 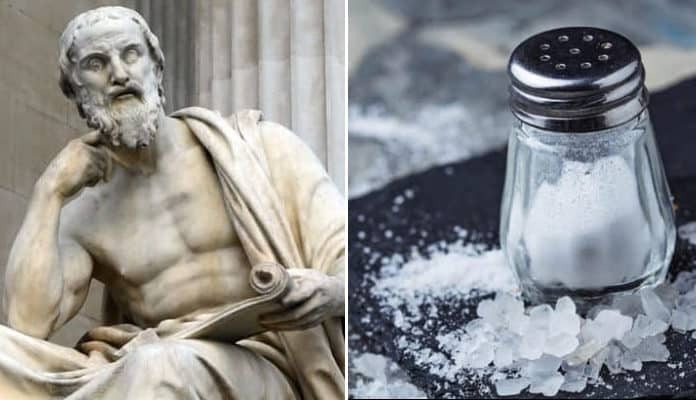 After the people of the early civilizations realized that salt could make food taste better, they started looking for other ways to deal with salt. It was not too long before one culture realized that they could trade the salt they had for different goods from a different civilization. Therefore, for centuries after this, ancient cultures used salt for their trade. In fact, Morocco south across the Sahara to Timbuktu is one of the most recognized salt trade routes known today. Ancient Greek civilizations would receive salt from the Ancient Egyptian civilization. Hundreds of ships would sail the Mediterranean and the Aegean seas carrying salt from one area to the next. The Ancient Greek historian, Herodotus, discusses one of the many trade routes which united the salt oases of the Libyan desert. Another historical figure, Marco Polo, was said to have returned from his adventures from Cathay in 1295 with tales of salt and its value in other areas of the world.